Against my recommendation a relative recently bought a 32GB USB flash drive off Trade Me. It cost something like $85 when such drives are currently about $130 at wholesale rates. 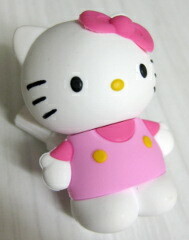 Apart from the fact the Hello Kitty style didn’t really suit the buyer, it appeared to work fine at first glance. The owner attempted to copy 31GB of movies onto it. I was immediately suspicious when this took about 2.5 hours on a modern PC. Sure enough, most were missing and those that weren’t didn’t play. As this counterfeit USB drive problem seems to be widespread there are some free nifty tools around to detect such annoyances such as USB Flash Tools, a FOSS Windows application. A good option in Linux is the badblocks command. In this case the damage was so bad every copy of the file ended up with a different checksum. The last I heard was that the buyer received a successful refund. I guess he was lucky in this case. Investigation reveals that these counterfeit drives seem to fall into two categories; those that leave the factory genuinely working and total factory rejects (such as the one above). In both cases some party buys a bulk lot and uses one of several tools (e.g. iCreate, AlcorMP) to hack the drives firmware and have the controller present a different size to the flash chip attached to it. I’d say many people never pick up on what is going on until it is far too late.